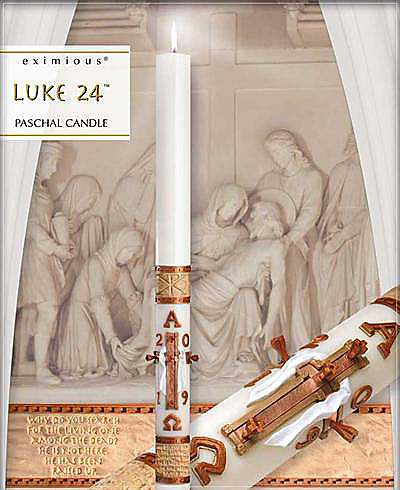 51% Beeswax, 2" x 44"
Eximious 51% Beeswax Paschal candles from cathedral Candle Company are a tribute to the craft and art of more than 100 years of exceptional candle making. Each and every Eximious candle is made-to-order, master crafted with the finest beeswax formulation, and an individual work of art. All are hand tooled to create intricate inlays, rich onlays, and classic sculptured engravings. Because all Eximious candles are made-to-order please allow four weeks for delivery. For additional sizes please call our custom sales department at 1-800-237-7511.